Actress Lindsay Lohan suing Rockstar Games claiming they used her likeness for a character in Grand Theft Auto. 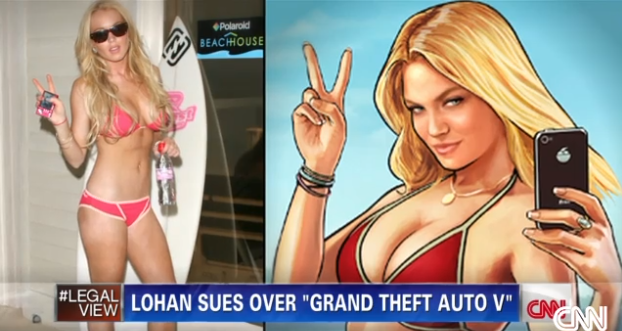 Lindsay Lohan has filed suit against a video game maker, alleging the company based the likeness of a character on her. The actress filed suit Wednesday in a Manhattan court against Take-Two Interactive Software Inc. and its subsidiaries, Rockstar Games and Rockstar North, over the character of Lacey Jonas from the game "Grand Theft Auto V."
According to the suit, Lohan alleges the company based the character on her and "incorporated her image, likeness, clothing, outfits, Plaintiff's clothing line products, ensemble in the form of hats, hair style, sunglasses, jean shorts worn by Plaintiff that were for sale to the public at least two years before the Defendant's release of the GTA V game." The suit goes on to say that "the game also features Hotel Chateau (Marmont) in West Hollywood, a place where the Plaintiff once lived and often frequents." In the popular video game, the character is an actress who complains of being pursued by paparazzi and asks another character to help her flee. The character utters such lines as, "They cannot get a shot of me," and "How's my hair? Do I look cute?" In an e-mail, a spokeman for the company told CNN, "It is our company policy to not comment on legal matters." It would not be the first time Lohan has taken to the courts alleging others were trading on her and her image. In 2010 she sued E*Trade over a Super Bowl commercial that made mention of "that milkaholic Lindsay," which Lohan alleged was a reference to her. In 2011 she sued rapper Pitbull for using her name in a lyric of the song "Give Me Everything Tonight." The suit against E*Trade was reportedly settled, and her suit against Pitbull was dismissed, according to The Hollywood Reporter. I don't blame her. Don't use my without not trying to pay me.